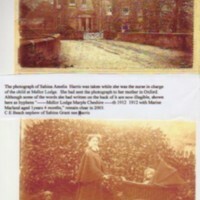 Photocopy of tinted photograph showing Mellor Lodge and black and white photograph of Nurse Sabina Amelia Harris and child in a pram. Typed text explains that handwritten note on the reverse states that the the child is Marise Marsland aged 1 year 4 months and were sent to her mother dated 1912 . 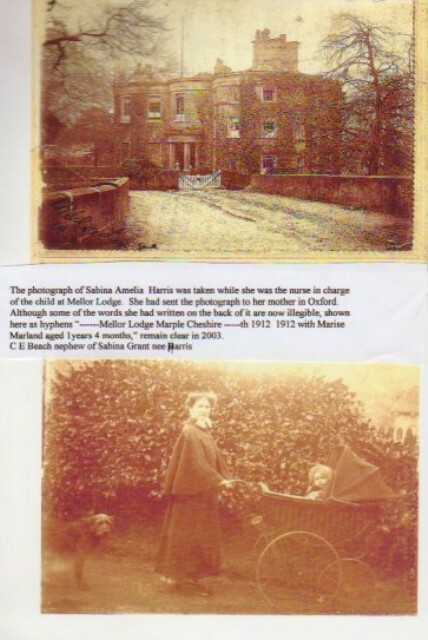 “Mellor Lodge : Nurse Sabina A Harris : 1912,” Marple Local History Society Archives, accessed April 24, 2019, http://marplelocalhistorysociety.org.uk/archives/items/show/2335.